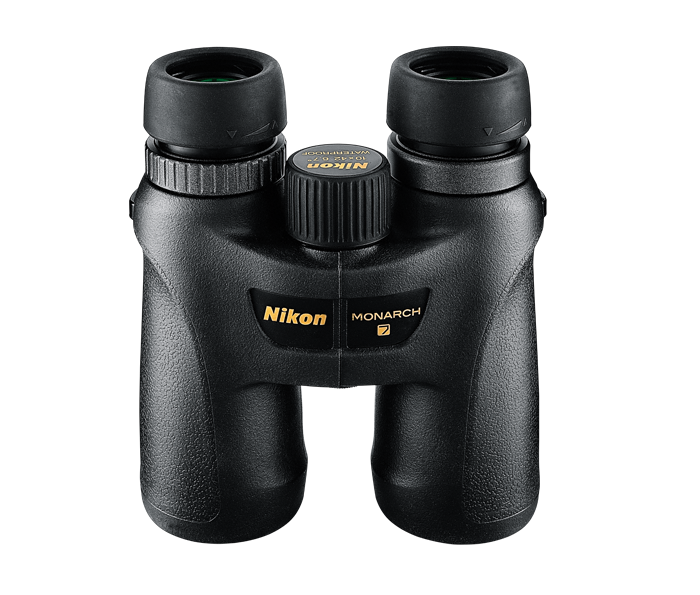 The hallmark of the MONARCH 7 is its optical system—a seamless carrier of light that utilizes Nikon’s premium ED (Extra-low Dispersion) glass and proprietary lens and prism coatings. This heart of the MONARCH 7 not only pushes resolution and brightness to extreme levels, but also further enhances your viewing experience with an amazingly wide field of view, close-focus capability and comfortable eye relief. The sophisticated coating Nikon applies to MONARCH 7 goes far beyond conventional coatings. Dielectric Multilayer Prism Coatings, which provide an even, higher light transmittance across the entire visible light spectrum, are applied to all of the lens and prism surfaces that transmit light. This technique provides almost the same brightness as that perceived by the naked eye, and clear, high-contrast images that display accurate color reproduction. MONARCH 7 roof prisms are coated with special phase-correction coatings to enhance resolution, contrast and true color rendition for a sharp, high-resolution viewing experience at any distance. Provide clear and bright images even when conditions are far from ideal. Built to handle any environment, this is one piece of equipment you can always count on to perform. Easily bring objects into focus with this comfortable and ergonomic design. Allow a custom eye relief fit to your eye for maximum comfort and a full field of view. Delivers the brightest high-resolution viewing experience yet plus an amazingly wide field of view, close-focus capability and comfortable eye relief. Applied to all of the lens and prism surfaces, provides an even, higher light transmittance across the entire visible light spectrum. Enhances resolution, contrast and true color rendition for a sharp, high-resolution viewing experience at any distance. Waterproof, fogproof and rubber-armor coated—built to handle any environment. Nearly the same brightness as perceived by the naked eye along with clear, high-contrast images with accurate color reproduction. Close-focus capability to 8.2 ft.
Get a sharp view of a subject just 8.2 ft. away.